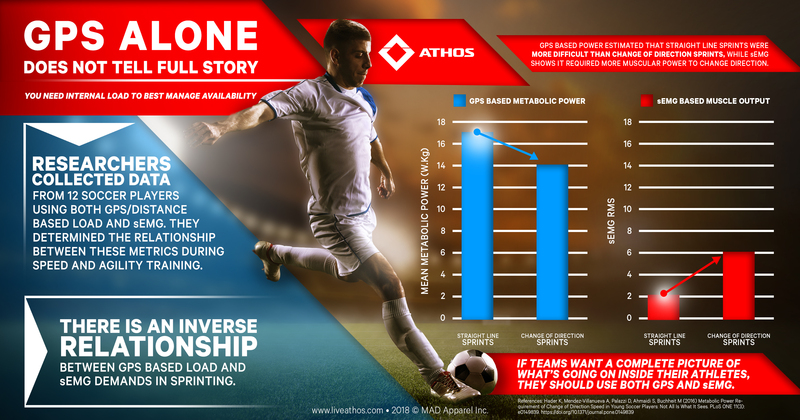 Athos provides unparalleled resolution in quantifying the stress placed upon an athlete’s body. Coaches of most sports have relied on accelerometer, heart rate, or ratings of perceived exertion (RPE) data to quantify how hard their athletes are working. In contrast, a revolution in cycling technology in the early 90&apos;s involved quantifying power- the amount of work/second- their athletes were doing at each time point. Using this methodology, coaches can accurately quantify how much external work their athletes are doing and use this to determine when to rest an athlete or when to push them further. When combined with a measure of internal stress such as RPE, the coach can begin to understand when an athlete may be accumulating too much or too little of this stress. To date, power is ubiquitous among professionals and amateur cyclists interested in training properly. Much like the revolutionary power meter, Athos sEMG technology can be used to quantify how difficult a practice was. 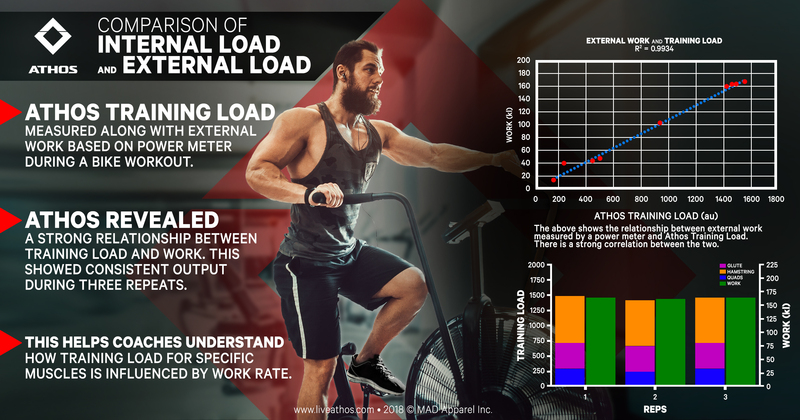 We compared our metric of training load to the gold standard: the work quantified from a power meter. There is a strong relationship between work (how hard the effort was) with the training load required to perform this. Given this relationship, we can easily understand if an athlete is fatigued- they will require more internal training load (based on EMG) to accomplish the same external task (power, in this case). To date, there is no method to accurately quantify internal and external stress that works in a team sports environment. While other technologies aim to provide this information, GPS data alone can dramatically underestimate the difficulty of an activity such as change of direction sprints. Moreover, accelerometer or GPS data will underestimate the stress experienced by an athlete as not all stress is due to movement alone. This is highlighted when comparing positions such as point guard to a forward, who will experience more internal load when rebounding or playing defense in the post, which is not always captured by accelerations. 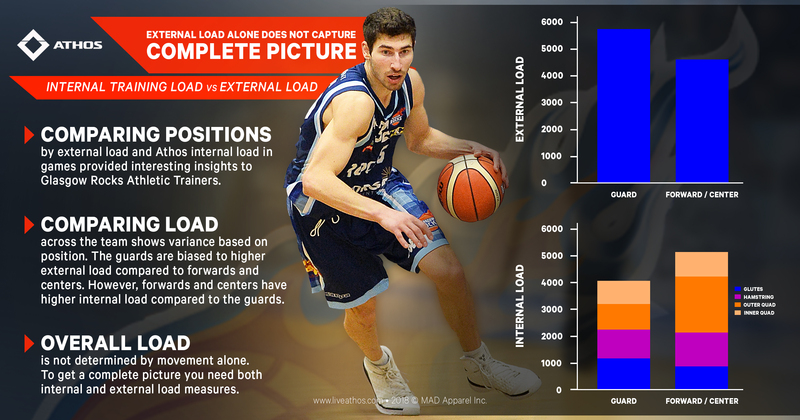 Our training load corresponds well with how hard an athlete is working over the session. 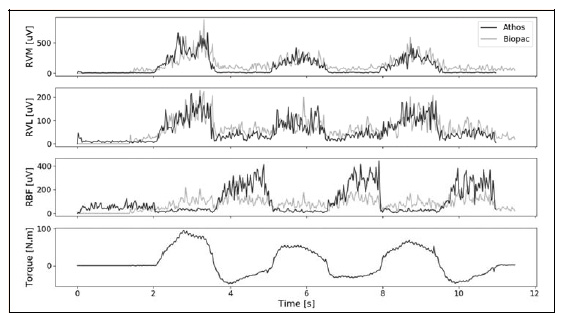 In this way, training load per second may be used analogously to power for cyclists. For example, the figure below shows a synchronous change in training load/s with increased velocity. 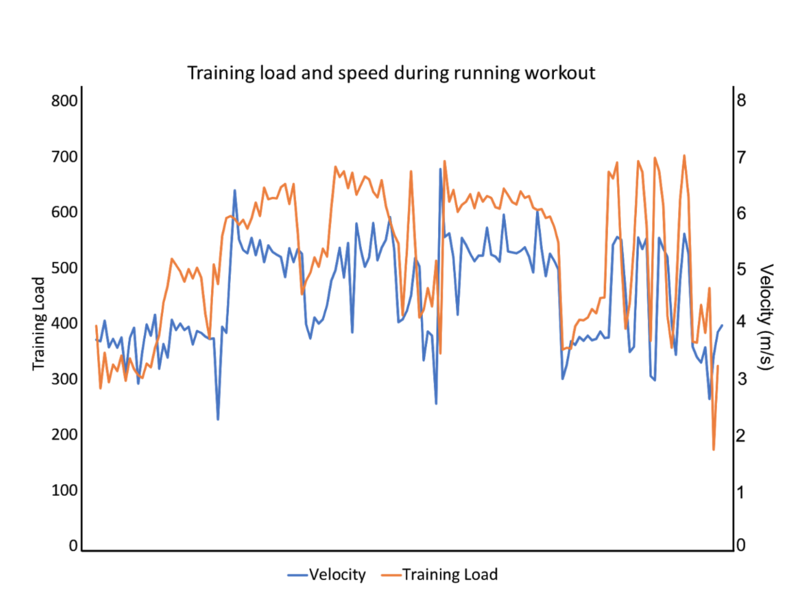 Training load is in orange and velocity of the athlete is in blue. The athlete began with a warm-up, then had three relatively long efforts followed by four short bursts of speed. In this example, the session was well programmed for the athlete as we saw no decoupling between training load and speed. 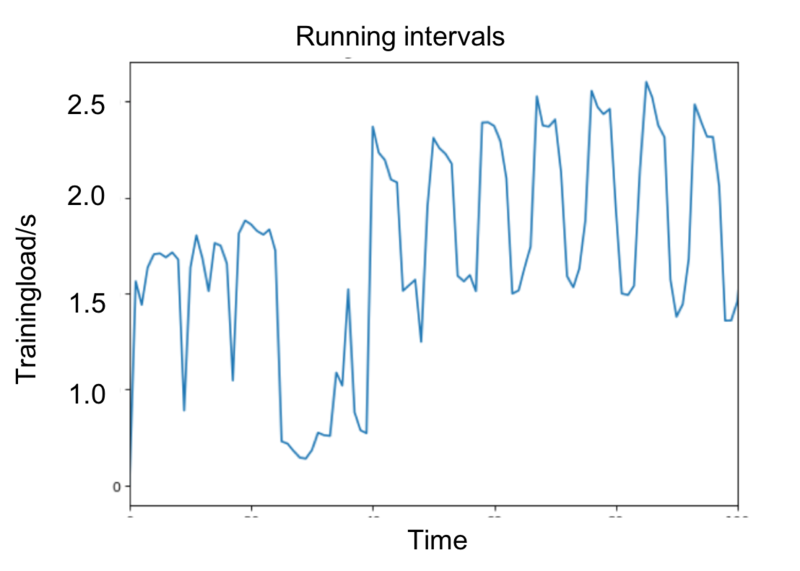 In the figure below, the athlete performed another running workout, where they had to maintain the same speed for 7 x 400m repeats. The overall trainingload increases for each interval, which shows the internal effort increasing to maintain their goal. In this figure, the same athlete was asked to perform seven 400 meter repeats at the same time. Each successive 400 required more load than the previous. This was accompanied by an increase in fatigue (reported by an increase in RPE). 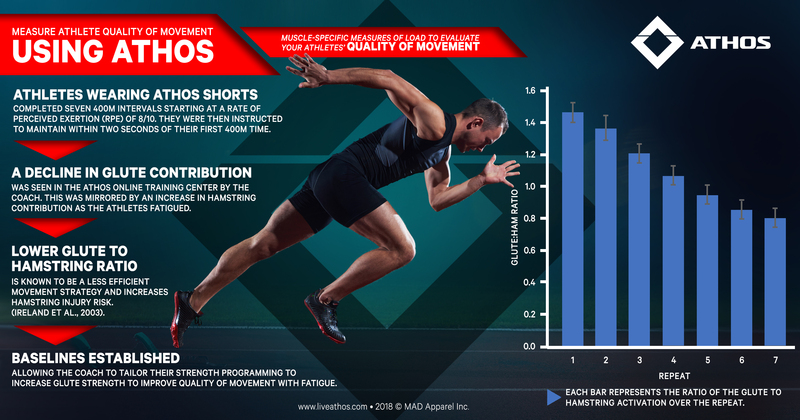 Moreover, there was an increase in hamstring activation and a decrease in glute contribution. This is less optimal movement strategy as the glutes are generally stronger than the hamstrings and the glutes only cross the hip while biceps femoris crosses both the hip and knee. 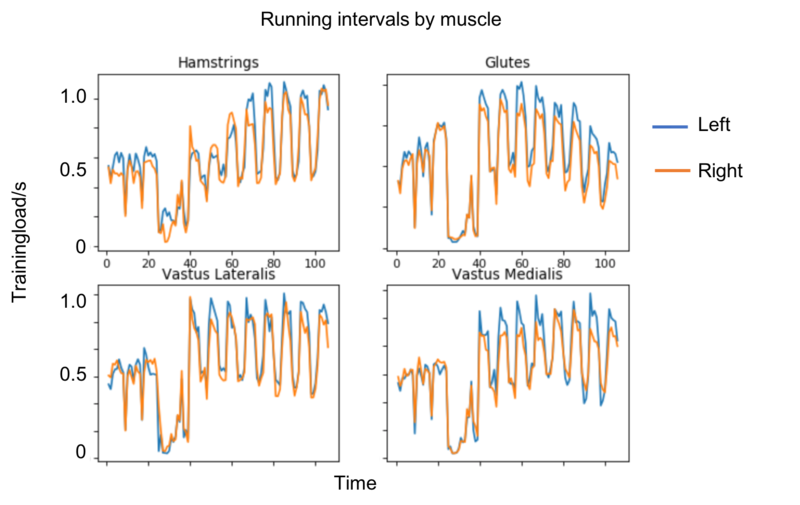 In addition to load monitoring, Athos provides unparalleled insight into how each muscle group is being stressed. For example, an important metric that helps prevent injury (Ireland et al., 2003) is the glute/hamstring ratio. Using Athos, coaches do not have to sacrifice other metrics such as accelerometer or heart rate data, since we have incorporated those metrics into our product as well.